LCR Embedded offers a full suite of future-facing design, engineering, and manufacturing capabilities to our customers. Nevertheless, we remain committed to supporting our customers’ legacy systems as well, as shown by our recent acquisition of two new state-of-the-art computerized wire-wrap machines. Our years of experience, coupled with LEAN and Six Sigma manufacturing practices, maintain wire wrap’s position as an affordable solution for our customers — especially when compared to costly upgrades and re-qualifications. 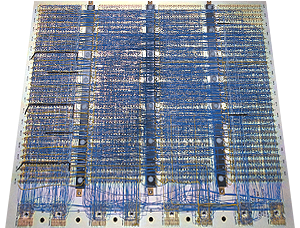 We offer an array of wire wrap options, including MIL-C-28754 automatic contact insertion, and automatic/semiautomatic wire wrap in accordance with MIL-STD-1130 and NAFI headers (daughter card connectors).